Designed to be the most compact and versatile camping fork on the market the Folding Camping Fork is perfect for cooking food over the campfire. This sturdy barbeque fork uses tension to flip open and its heavy duty construction can handle even the toughest cooking uses. Like its Rolla Roaster cousins, the Folding Camping Fork features a rotisserie turning knob, a heat resistant handle that is easy to grip, and a stainless steel shaft. 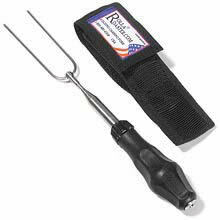 The fork folds back for safety, telescopes from 7.5 inches to 48 inches, and comes in a durable nylon belt case. Despite its sturdy build, this campfire toasting fork weighs only four ounces. The Folding Camping Fork is a perfect gift for all those hard-core, outdoor adventurers in your life! to purchase your Folding Camping Fork today. For a limited time only when you purchase 5 Folding Camping Forks you will receive one free! (Also look for special deals on holiday shipping.) Enjoy the adventures! Posted in Campfire Cooking and tagged barbeque fork, buns, campfire cooking, camping, holiday shipping sale, hot dogs, marshmallow toasting fork, re-release sale, steak.